2018 Outstanding Research Park Award: GENOPOLE. 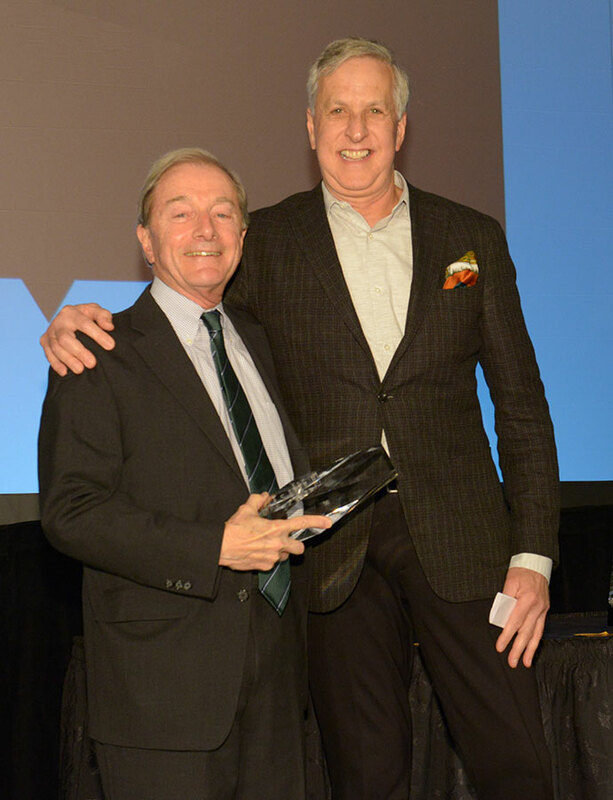 Accepting on behalf of GENOPOLE is Denis Gauvreau, PhD. 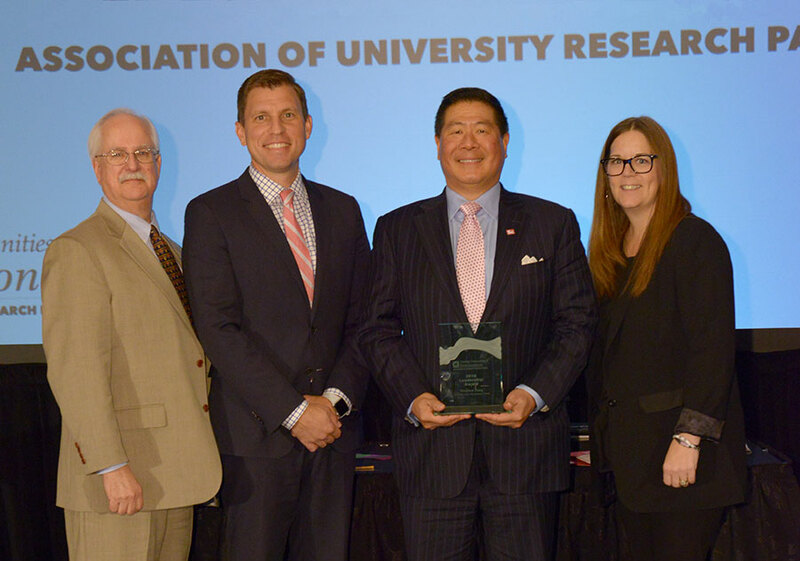 College Park, MD, October 25, 2018 – The Association of University Research Parks (AURP) today announced this year’s Awards of Excellence recipients during a luncheon at the 2018 International Conference hosted by the University of Maryland’s Discovery District in College Park, MD. 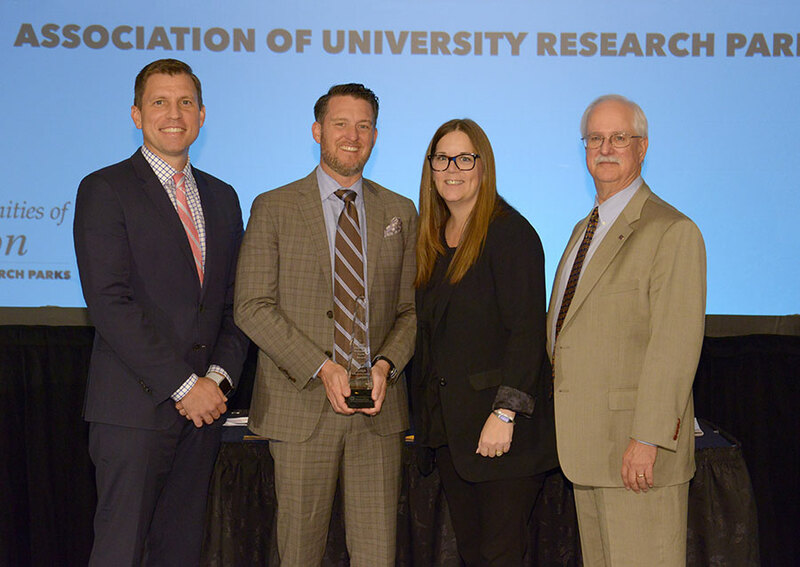 Throughout the conference, the association announced other award recipients and this morning, AURP announced the newest members of its 2019 Board of Directors and the organization’s elected officials. 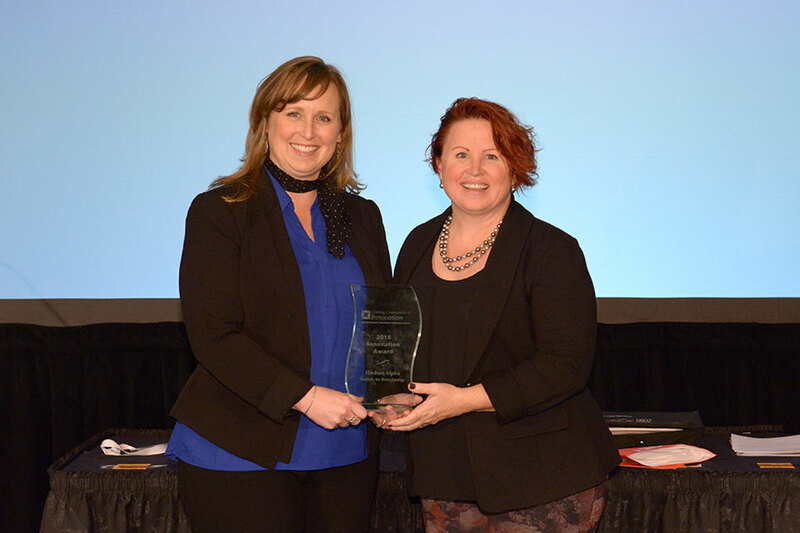 This year’s 2018 Awards of Excellence categories included the Outstanding Research Park Award, the Developing Communities of Innovation Award, the Emerging Research Park Award, the Leadership Award, the Vision Award, the Innovation Award and three Career Achievement Awards. Additional awards were received by two members of Congress. GENOPOLE, based in Évry, France, a suburb of Paris, received the Outstanding Research Park Award in recognition of its development of the first and largest Biocluster community in France. GENOPOLE was created by Region Île-de-France, the Department of Essonne, Évry and by the French Ministry of Higher Education, Research & Innovation. Over the past two decades, more than 200 start-ups have called GENOPOLE home, along with 19 public research laboratories and 25 shared-use technology platforms. GENOPOLE elevated the biotechnology industry to new prominence in France while driving the revitalization of the city of Évry. In the last decade, GENOPOLE has raised over €620 million for its portfolio of companies, enabling seven of those firms to become publicly traded. The research park continues to expand and is opening a fifth campus in Évry with an additional 37,000 square meters under construction with a planned opening in 2021. As one of the most recognized research parks in the world, the Research Triangle Park (RTP) is home to 250 companies and research and development programs in industries that include, micro-electronics, telecommunications, biotechnology, chemicals, pharmaceuticals and environmental sciences. More than 50,000 people commute to RTP to work with some of the largest companies in the world, like 3M, GSK, BASF, Bayer, IBM, Cisco, CSX and Norfolk Southern, to name a few. This biocluster has created a centralized region for research and development, anchored by three prestigious universities: NC State University, Duke University and UNC-Chapel Hill. Because of these relationships, companies in a wide range of industries from across the world invest more than $300 million annually into these universities and others in the region for research and development. The park is home to 80 startups and spinoffs, having landed more than 3,300 patents and 1,975 trademarks. 2018 Emerging Research Park Award: Lehigh University Mountaintop Campus. Accepting on behalf of Lehigh University Mountaintop Campus is Cameron McCoy, PhD. Lehigh University acquired the former Bethlehem Steel Homer Research Laboratory in 2013, which had been vacant for almost a decade. Lehigh University made renovation of the facilities a priority and added an additional 120,000 square feet of new construction, creating a new footprint for the 435-acre campus. The investment has netted more than $60 million in new investments in the facility and its portfolio of companies with an estimated $180 million in investments expected over the next 10 years. By 2020, it is expected that the campus will increase in scale by at least 25 percent of its current research and commercial activity, leading to increased future investments and partnership opportunities. 2018 Leadership Award: Stephen Tang, Ph.D. Leadership Award – Stephen Tang, Ph.D. Throughout his career, Dr. Tang established a path of leadership and had an entrepreneurial spirit working with startups and established firms. In 2008, he joined Philadelphia’s University City Science Center, a unique partnership between 30 regional shareholders focused on promoting innovation and partnerships. His vision for the Science Center was to develop several incubators, accelerators and business programs, which led to such award-winning programs as FirstHand, Phase 1 ventures, the QED Proof-of-Concept funding program, the Digital Health Accelerator and Quorum. These programs have since become the trademark of the Science Center. 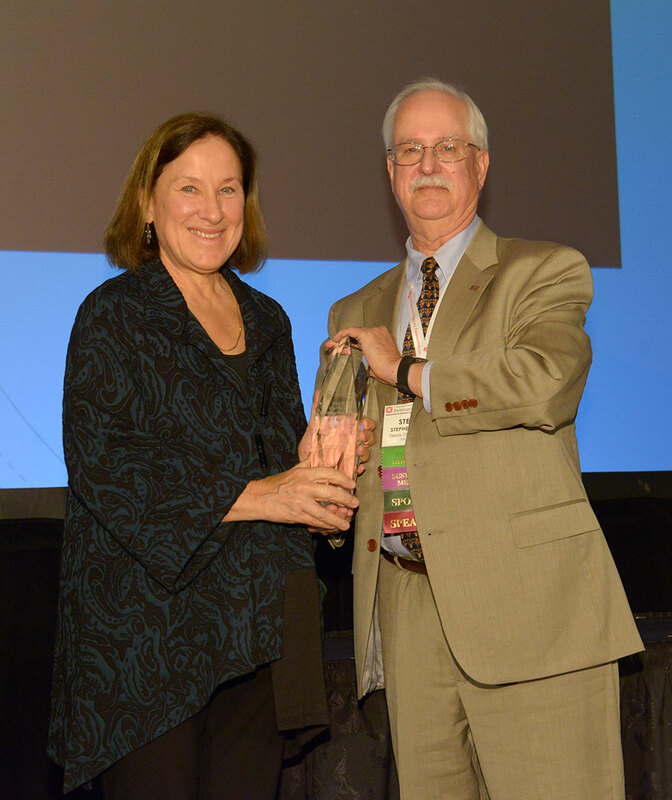 2018 Innovation Award: HudsonAlpha Institute for Biotechnology, Huntsville, Alabama. Accepting on behalf of HudsonAlpha Institute for Biotechnology is Amy Sturdivant. The HudsonAlpha Institute for Biotechnology is a genomics-based research institute which uses a unique approach to research and clinical applications by focusing on four key aspects of health and well-being: education, research-driven discovery, clinical care and entrepreneurship. HudsonAlpha is home to 15 faculty investigators, over 30 associate companies and more than 800 independent researchers and workers. HudsonAlpha founders Jim Hudson and Lonnie McMillian are both serial entrepreneurs with career paths that led each to understand the promise of genomics and the need for measurable, real world results. HudsonAlpha offers free genetic cancer risk testing, through the Information is Power initiative, to residents of Northern Alabama to provide early detection, prevalence and gene-influenced therapy recommendations. By the end of this year, it is expected that HudsonAlpha will be sequencing over 70,000 genomes per year. Charles D’Agostino: Since 1988, Charles D’Agostino has been the Executive Director of the Louisiana Business and Technology Center, and later the LSU Innovation Center. In this role, Mr. D’Agostino has helped to provide business services across the state, including a unique program for a 30-seat mobile entrepreneurship classroom that has also become a means of providing disaster counseling for businesses in 37 rural parishes and towns impacted by hurricanes and other natural disasters. This was particularly beneficial in 2005 following Hurricane Katrina, when he unselfishly committed to assisting businesses throughout the region. 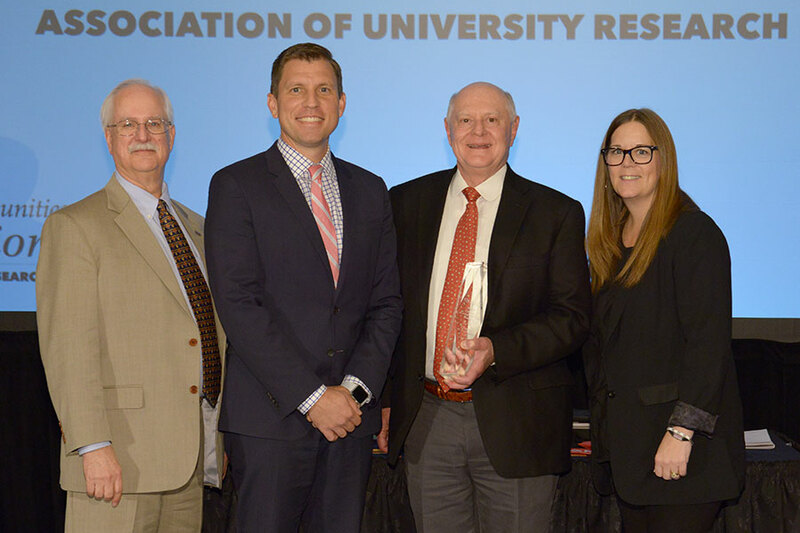 Additionally, he received recognition and honors by being named President of AURP and President of InBIA, and he was recognized as a Fulbright Specialist assisting an earthquake-stricken region of Italy plan for rebuilding by incorporating elements of the innovation economy. 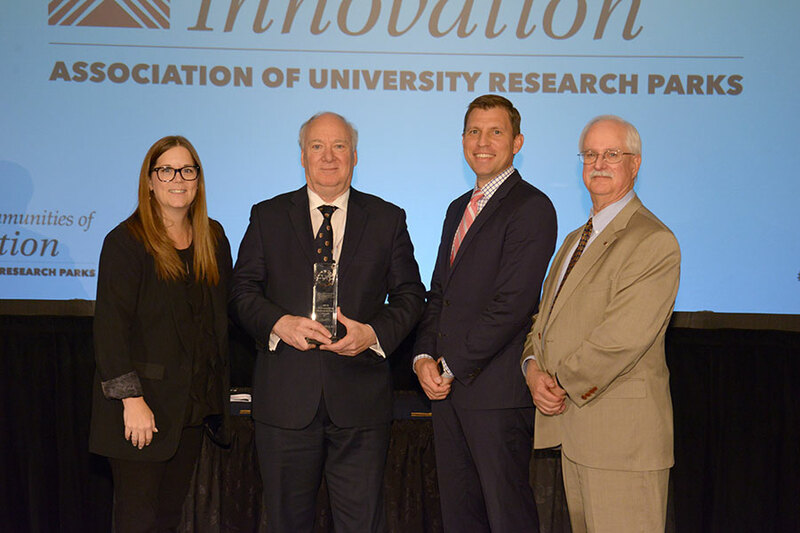 During his tenure at the LSU Innovation Center and Louisiana Business and Technology Center, these research parks were named Incubator of the Year and received the AURP Award of Excellence as Emerging Research Park of the Year. Ilse Treurnicht, Ph.D.: Dr. Ilse Treurnicht has spent most of her career working with startup, emerging and growth stage firms, product commercialization and as the CEO of a regional venture fund focused on physical and engineering sciences. In 2005, she joined the MaRS Discovery District in Toronto as its first full-time CEO. Under her leadership, MaRS was able to execute on its mission and vision transforming it into an internationally recognized innovation hub. Dr. Treurnicht guided MaRS through the critical loss of a development partner for their Phase II project. Through her leadership, the discovery district replaced the lost commitment on its own with private sector financing for the real estate assets. From 2008 to 2015, MaRS supported ventures that raised $2.6 billion in capital and generated $1.3 billion in revenue. Of particular note is how Dr. Treurnicht fostered an innovative and diverse environment with more than 30 percent of MaRS-supported ventures having at least one female owner. In late 2017, she retired from her role as CEO of MaRS, but she continues to take an active role in promoting and influencing entrepreneurs and start-ups. Tom Hall: Tom Hall’s experience in the tech park business spans 50 years, beginning in 1968 with the development of Tech Park Atlanta as part of a long-term growth plan for Georgia Tech and the state of Georgia. Hall and his real estate development partners understood the complexity and challenges facing a functional tech park and the novel financing they used to fund the park was based on gifts given to Georgia Tech by alumni. Based upon this platform, Mr. Hall co-founded The University Financing Foundation (TUFF) in 1982 as a national not-for-profit real estate operating foundation whose mission was to provide facilities and equipment to institutions of education and research at below-market cost. In 2001, Mr. Hall was named CEO of TUFF, and since opening its doors, the organization executed on over $1.3 billion in projects at university and research facilities. In March 2018, he stepped down as CEO, but he remains involved with TUFF’s future as Vice-Chairman of the Board of Directors. 2018 Vision Award – U.S. Senator Jerry Moran (R–KS): Senator Moran has been a steadfast supporter of innovation centers and research parks. He has been an avid supporter of the Regional Innovation Strategies Program in the Senate and speaks regularly about the need to promote entrepreneurship and startups. In October 2017, he co-sponsored a bi-partisan bill with Senator Mark Warner of Virginia, along with Senator Roy Blunt of Missouri and Senator Amy Klobuchar of Minnesota, to promote job creation and business growth through the aptly named, “Startup Act”. 2018 Leadership Award – U.S. Representative Steny Hoyer (D–MD, 5th District): U.S. Representative Steny Hoyer is a strong supporter of research parks, innovation hubs and the associated universities and businesses. He has provided guidance and support to AURP and its Government Relations Committee in its outreach to government leaders. He has also been an advocate in congress for the Power of Place and Power of Place 2.0 white papers from AURP Past-President, Brian Darmody in understanding the importance of university research parks and their impact on the economy and local communities. Additionally, AURP announced that TechSquare at the Georgia Institute of Technology (Georgia Tech) will host the AURP 2019 International Conference from November 4–8, 2019.